BANGKOK (17 January 2011) – Thai Country Club, one of the country’s premier championship venues, will end a 3-year tournament hiatus on 24 January, when it plays host to Queen Sirikit’s Breast Cancer Centre Benefit Tournament, an annual event that places golf in the vanguard of Thai cancer research and prevention. All proceeds from the event go to support the acquisition and installation of MRI equipment at Queen Sirikit’s Breast Cancer Centre at Chulalongkorn Hospital, part of the Thai Red Cross. Accordingly, both the tournament and trophy are named for Queen Sirikit. Participation in this 4-person team event – open to all amateurs, men and women – requires a per-team donation of either 50,000 ThB (pink level) or 30,000 ThB (white level). All participation fees, in addition to any donations made to the Breast Cancer Centre, are exempt from tax, according to Thai Country Club General Manager T.W. Hughes. Thai Country Club (www.thaicountryclub.com) was founded in 1996, less than a year later Tiger Woods made his Asian debut here, headlining the 1997 Asian Honda Classic. 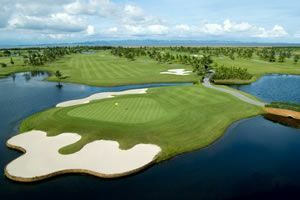 In 1998, the region’s most prestigious professional tournament, The Johnnie Walker Classic, was contested over TCC’s celebrated course, a Denis Griffiths design that subsequently served as site of three consecutive Volvo Masters Asia, from 2005 to 2007. However, since that time the prestigious members’ club has kept a low profile. 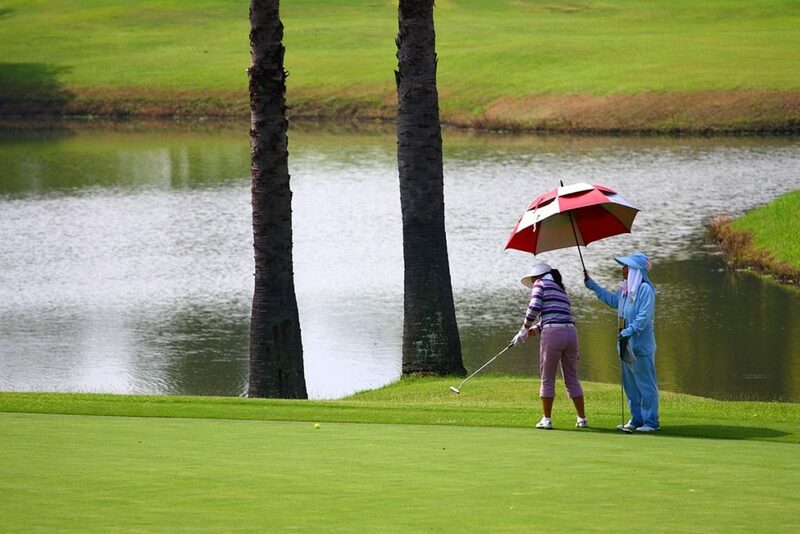 Queen Sirikit’s Breast Cancer Centre Benefit Tournament signals an end to this lull. “We want to make this event very special,” Hughes said. “All the staff will be wearing pink ribbons on 24 January. We have arranged for pink ribbons on all 18 flags. For the clubhouse we have commissioned a carved teak case where we will prominently display the trophy year-round. 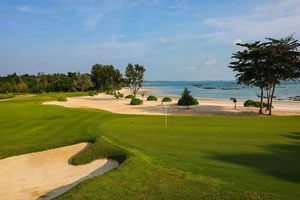 Thailand has been the focus of world golf these past few months. In November, Tiger Woods and Thongchai Jaidee headlined a Skins Game exhibition in Bangkok, while the Asian Tour visited Hua Hin 16-19 December for its Black Mountain Masters. Next week, Europe’s top touring professionals compete with their counterparts from Asia in The Royal Trophy, another event set for Black Mountain Golf Club. “We enthusiastically applaud Thai golf taking centre stage with these international golf competitions, but Queen Sirikit’s Breast Cancer Centre Benefit Tournament is special because it’s supported by the Thai people to benefit the Thai people,” said Hughes. “We are so pleased to play a role. Sixty percent of the Thai Country Club staff is female, of course, and all the others have mothers, wives, sisters and girlfriends. “Breast cancer is a very personal matter that nevertheless affects us all. Everyone knows someone – a family member, a close friend – who has dealt with this disease. Thai Country Club has pledged a 3-year commitment to host Queen Sirikit’s Breast Cancer Centre Benefit Tournament, not just as the venue but also as a co-sponsor. Additional sponsors include the AIM Star Network, Mahajak Group, Betagro and Siam Gas. For 2011, the stroke-play tournament will be conducted as a 4-person team event, whereby points will be calculated using System 36 in calculating handicap. Winners will be crowned according to the lowest net scores. Play will be conducted according to rules certified by The Royal & Ancient Golf Club of St. Andrews, with local rules set by the Thai Country Club committee in charge of the tournament. The entry fees include green fee, caddie, golf cart, driving range access, lunch, dinner, and souvenirs for the entire team. In addition to various prizes, the name of the winning team will be carved on the trophy, to be kept on display at TCC indefinitely. The winning team will receive a model trophy to bring home.